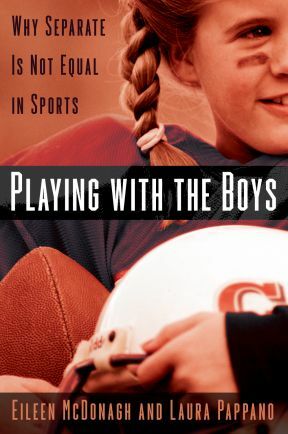 By Laura Pappano and Eileen McDonagh authors of Playing With The Boys: Why Separate is not Equal in Sports. British marathoner Paula Radcliffe’s victory in last Sunday’s NYC Marathon raises an intriguing idea: Might pregnancy be a boon to female athletes? The notion is compelling not just because it might be physiologically true, but because it challenges the most basic beliefs about women’s bodies, namely that the very stuff that enables them to be moms – estrogen, menstruation and pregnancy – dooms them as athletes. This is not to say that women can’t perform athletically after bearing children – many have – but the assumption is that being female is an obstacle, not a benefit, to becoming and being a first class athlete. That’s because in the hierarchy of sports, male athletes are assumed to be superior to females. As the dominant group, it is males that are used as the standard against which the subordinate group, females, are compared. Consequently, women athletes are defined by what they lack compared to what males have. Thus, women athletes become inferior to men because women lack height, upper body strength, body weight, lean body mass, not to mention testosterone, that magically fabulous hormone which allows more muscle development. (Actually, women don’t lack testosterone, they just do not have as much of it as do men.) What is more, what women do have that men don’t is assumed to be athletic handicaps. Not only are women too short to dump balls in basketball, too weak in upper body strength to box against men, to flimsy to be linebackers on football teams, but women also have what is assumed to be the all but evil hormone, estrogen, which burdens them with higher percentages of body fat. The physical differences between males and females – particularly women’s reproductive organs – have been for most of human history pointed out as the source of female inferiority. Seventeenth century physicians viewed menstrual discharge as a literal “leak” with the uterus representing the weakest part of the female body because it failed to hold its contents. Dr. Regnier de Graaf actually compared blood leaving the uterus to wine seeping out of a defective barrel. By locating female weakness in the womb, men (who had no such equivalent body part) were exempt from faults that, biologically speaking, could only belong to women. Such thinking has informed social standards and rules. Women, in other words, needed to be “protected” – on and off the field. Females were first banned from higher education out of fear that intellectual work would draw too much blood to the female brain, leaving the uterus barren. Limitations on women’s work hours were linked to presumptions about female physical weakness. Worries about females overexerting themselves led in 1902 to the U.S. Lawn Tennis Association to restrict women’s play to two out of three sets instead of three out of five. The rule still stands. The pamphlet didn’t include warnings about running because – well – that was obvious. When several women collapsed during the 800-meter race at the 1928 Olympics, it was more “evidence” and women’s distance events were curtailed. It wasn’t until 1984 that women could run the marathon in the Olympics. Bodily differences between men and women as groups, of course, are real. But what is not real is the assumption that all of these bodily differences privilege men. Not so. Some bodily differences privilege women. Body fat, for example, privileges women in long distance swimming as a source of buoyancy and insulation against cold, a sport in which women excel over men. A lower center of gravity rather than upper body strength privileges women in sports such as wrestling, where the goal is to keep one’s balance, and in fencing, where bicep muscle might is irrelevant, both sports in which women excel in competition against men. Similarly, weighing 300 lbs and being over 6 feet tall is an absolute disqualification for equestrian sports, but privileges women whose lower weight and height render them perfect candidates for athletic performances not only involving horses, but also race cars, airplanes, boats, and rockets. And now it appears that even pregnancy might be a boon for athletic performance, at least for marathoners as it now appears that women’s bodies are not only capable of handling endurance events, but those niggling bugaboos (estrogen, body fat – and now, pregnancy) may be a physical advantage. Research shows estrogen may be a key to female ultraendurance success (women have beaten men outright in ultramarathons and marathon swims). Estrogen may increase water retention (slowing dehydration), may minimize skeletal muscle damage and soreness – and even delay onset of fatigue by spurring serotonin production (increasing energy and elevating mood). Radcliffe is not the first mother to compete professionally after giving birth to a healthy baby, but she may be the first marathoner to train throughout pregnancy, even running the day before going into labor, not to mention subsequently winning a marathon after pregnancy. The question is whether her rigorous regimen during pregnancy as well as physical changes of pregnancy itself might have been helpful to her as an athlete. Blood volume rises about 60 percent during pregnancy, mimicking the effects of blood doping in which greater blood volume allows more oxygen to be carried to the muscles. Muscles use oxygen to produce ATP or adenosine triphosphate, which fuels muscle contractions. (The volume and speed of this process is aerobic power or VO2max). Male athletes are touted as physiologically advantaged because, on average, a male’s VO2max is 50 percent greater than a female’s. But how does a pregnant athlete’s VO2max stack up? While blood volume returns to normal within four to eight weeks after giving birth, it’s unclear exactly how training through pregnancy and birth might enhance an athlete’s post-partum performance – or how increased blood volume early in pregnancy might be a boon. Obviously, pregnant world-class female athletes-in-training are not an easily studied group. But Radcliffe’s win offers a powerful counter-image to the incapacitated female with child, namely, the pregnant super-athlete who has a uterus that boosts athletic performance – a clear advantage that males lack.